VISUALIZATION OF THE RbmA PROTEIN. top: A small fragment from the myc gene (red) was inserted at the end of the bacterial RbmA gene (green). bottom: The myc fragment in the protein binds to anti-myc antibody (black "Y") which has been labeled with a fluorescent dye (purple hexagon). This month's essay was motivated by an article in the July 13th, 2012 issue of Science: "Molecular Architecture and Assembly Principles of Vibrio cholerae Biofilms" . Biofilms are discussed explicitly on page 108 of Life on the Dock (LOTD). The biofilms considered there are thick ones containing multiple species of algae and animals. These interfer with the movement of ships and the pumping of water. However, in the paragraph at the end of the section I mention that biofilms are also important in medicine. The section "Five stages of colonization" on page 102 of LOTD describes the formation of biofilms in more detail, pointing out that bacteria form the first layer in colonization of a surface that is submerged in the ocean. Filippo Pacini discovered that this bacterium is the cause of the disease cholera in 1854. We now know that its two circular genomes contain 4 million base pairs, and 3,885 probable genes (some of these have only been charaterized by nucleotide sequence, the protien hasn't been isolated or characterized). Only some strains of this bacterium cause disease, which is characterized by loss of fluid from extreme diarrhoea. The bacterial toxin that induces fluid loss from the intestinal cells is coded by a gene of a virus that is inserted into the genomes of some strains of the bacterium. In order for the bacterium to colonize the interior lining of the gut it must make and secrete an adhesive protein-polysaccharide matrix. Pathogenic strains both produce the toxin and are able to colonize the gut. Thus the medical relevance of this research. The techiques used in this research are as interesting as the results as they indicate the sophistication of modern biochemistry (aka molecular biology) research. 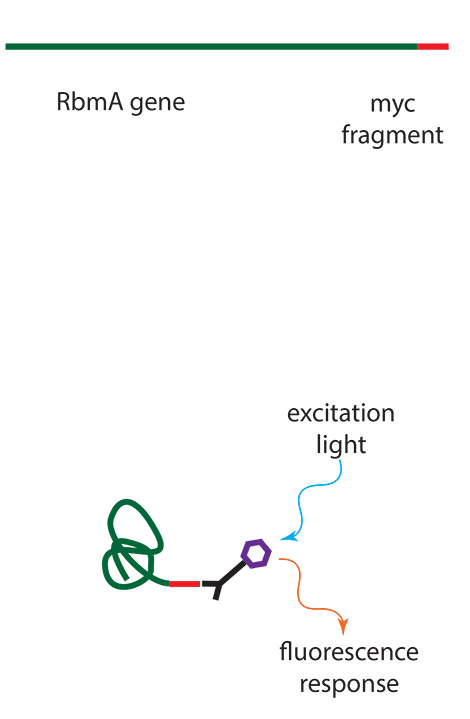 In order to visualize the bacterial protens that made up the biofilms the authors used specific antibodies which were labeled with fluorescent dyes. The straightforward approach would be to make antibodies to each of the bacterial proteins, but genetic engineering has become so powerful and commonplace that it was easier to alter the bacteria gene to make a chimeric protein in which a foreign (to the bacterium) protein fragment was added to the end to act as a "tag". For the RbmA protein they used a fragment of the myc (MYeloCytomatosis) protein, which is associated with human lymphoma, and thus has been widely studied by cancer researchers. Thus there is a cheap source of antibody to myc, and it was easier to make a new bacterial protein than to make a new antibody. Images of V. cholerae growing on a surface were obtained by several fluorescent microscophipic techniques. The RbmA protein enables cell-cell adhesion, Bap1 protein allows the growing biofilm to adhear to the surface, and mixtures of polysaccaride, RbmC, and Bap1 formed a flexible envelope that enclosed cell clusters. There are eight authors for this paper, and they provide an interesting story independent of the science. Most are from the University of California at Berkeley, one is from UC Santa Cruz, several are from Harvard University in Cambridge Massachusetts, one is from the Taksim Training and Research Hospital in Istanbul, Turkey, and the last author is from Washington DC. An increasing number of scientific articles have a large number of authors, partially because most research requires several areas of expertise. Authors often come from many locations, e.g. nations. The number of papers with authors solely from the United States, even in US journals, is few today; science has truely become international. The last author is Steven Chu, who is now the Sectretary of Energy in the Obama administration in Washington DC. Chu did pioneering work at the Bell Labs, developing techniques to move atoms with laser beams. The early emphasis was to use this method to cool atoms to extremely low temperatures, which has many important applications. It was mainly for this work that he was awarded the Nobel Prize in 1997. Chu moved to Stanford and used lasers to manipulate biological molecules, including DNA (his work in stretching DNA helixes thus overlaps the work I did in simulations of DNA stretching by molecular dynamics). Chu is the first member of the Cabinet to have the Nobel Prize. Molecular Architecture and Assembly Principles of Vibrio cholerae Biofilms. Science, 13 July, 2012, Vol 337 pg 236. However, unfortunately this article is not "open access", so you must have a subscription to Science, or access to a library that has one, or wait 6 months after the publication date to get free Internet access of the contents.